Nicki Minaj is so animated during her performance of Roman's Rvenge and Prince a true legend has the party rockin' during the Versace For H&M Launch. Before a lineup of celebrity guests that included Kesha, Jennifer Hudson, Uma Thurman and Jessica Alba, Nicki Minaj and Prince rocked the Versace for H&M fashion show at New York City’s Pier 57 on Tuesday night. Billboard says the pair took turns performing during the high-profile event. 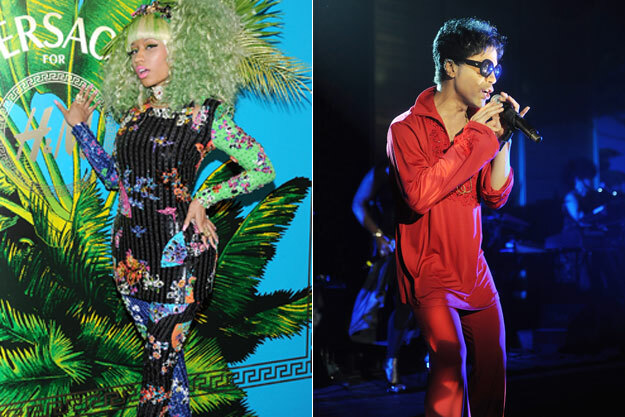 Decked out entirely in red, Prince played some of his classics, like ‘Purple Rain’ and the funky ’1999′ album track ‘D.M.S.R.’ Minaj went with a colorful Versace outfit and bright green wig.